In just 15 miles, Start Bay encompasses so much that people love about the South Devon Area of Outstanding Natural Beauty: the beaches that range between popular tourist destinations to peaceful coves, the rolling hills and unspoilt farmland, and the fantastic pubs and restaurants where locally-sourced seafood is a particular speciality. Explore Start Bay with our clickable map or simply read on for the full guide! In this guide, we’ll be showing you some of the highlights of Start Bay and letting you know where you can find out more. Start Bay in South Devon is a beautiful, historic stretch of coastline, running from Warren Point by the village of Stoke Fleming in the north to Start Point and its iconic lighthouse in the south. 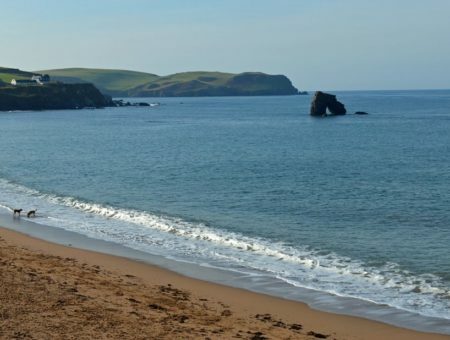 It includes the beaches of Blackpool Sands, Slapton Sands, Beesands and Hallsands, and the important nature reserves of Slapton Ley and Widdicombe Ley. The charming village of Stoke Fleming towers over Blackpool Sands and looks out across Start Bay. It’s a short but steep walk down to the beach, which provides some breathtaking panoramic sea views en route. Stoke Fleming is a quiet village but there is a highly active community at its heart. Look out for events at the Village Hall, and pop over to the Green Dragon pub on Church Street for a drink or meal. This popular pub is frequented both by local residents and groups of walkers, who often stop there to refuel as they hike along the South West Coast Path. Speaking of hikes, Dartmouth to Stoke Fleming is a scenic walk of around four miles each way. Set off from either Dartmouth Castle or Little Dartmouth car park for an easier route. Blackpool Sands, the northernmost major beach in Start Bay, is a stunning Blue Flag-awarded fine shingle beach. There is ample parking and a fantastic Venus Café and Takeaway, which is popular all year round with local residents as well as holidaymakers. Find out more about this wonderful beach and its facilities in our guide to Blackpool Sands here. There are showers and toilet facilities at Blackpool Sands, but be aware these can be locked when the café is closed. Please note that, as the beach and car park and privately owned, parking permits are not valid and charges do apply during the busier months. Strete is a picturesque village just off the bay, which is home to a well-loved pub, The King’s Arms, which was reopened after renovations in 2015. Like the Green Dragon in Stoke Fleming, this is a popular place to stop off for hikers, due to its perfect position on the South West Coast Path. The Laughing Monk is one of South Devon’s most highly renowned restaurants. Specialising in fresh, locally sourced seafood and other produce sourced from nearby farms around Devon, it won a Taste of the West award in 2010. Housed in a Victorian former school building, The Laughing Monk has a casual, friendly atmosphere and a reputation for the finest cuisine. Strete Gate beach sits at the northern edge of Slapton Sands. (Towards the tip of the beach is an area frequented by nudists.) Strete Gate car park is run by South Hams District Council, where full parking permits are valid. There are public toilets close to this car park and a seasonal van serving ice creams, snacks and drinks. Slapton is a beautiful old village, which is home to two popular pubs, the Queen’s Arms and the Tower Inn, both of which have an excellent reputation for their locally-focused menus as well as being warm and welcoming places to stop by for a drink. Slapton Sands is a long, fine shingle beach that’s popular with sunbathers, swimmers, anglers and watersports enthusiasts alike. Fortunately, as it’s over three miles long, there’s no shortage of space for everyone to enjoy their favourite beach activities. Roughly in the middle of Slapton Sands, you’ll find the Slapton Memorial Car Park, which is run by South Hams Council (full parking permits are valid). There are public toilets in the car park and a seasonal ice cream van. At the time of writing this update (April 2017), Slapton Sands is also achieving national fame as the best place to catch a glimpse of the 45-ft humpback whale that set up home in Start Bay, feasting on our shoals of mackerel and herring. Find out more about the Start Bay whale from local expert Peter Moore. Slapton Ley National Nature Reserve is a unique and precious habitat, which includes and surrounds a large freshwater lake. A narrow bar – amazingly narrow in fact when viewed from higher ground – is all that separates the fresh water from the salty sea. To find out more, we spoke to Andy Pratt, Senior Head of Centre at the Slapton Ley National Nature Reserve Field Centre. What’s special about Slapton Ley and the nature reserve? Slapton Sands is a 6km long barrier beach and the Lower Ley is the largest natural freshwater lake in the south west. These unique landscapes are home to a rich variety of birds including Cetti’s Warbler to rare plants that are adapted to the windy and sunburnt shingle beach ridge, including the yellow horned-poppy. What should visitors look out for around the Ley? Look out for a range of ducks and wildfowl on the Lower Ley including the Great Crested Grebe that feeds on fish in the lake. In spring you can see courtship displays and young chicks riding on the parents back. Listen out for the very distinctive songs of the warblers that live in and around the reeds on the waters edge including Black Caps and Cetti’s Warbler. On the Shingle Beach Ridge look out for plants flowering at different times of the spring and Summer, including Sea Thrift, Viper’s Bugloss and yellow horned-poppy. 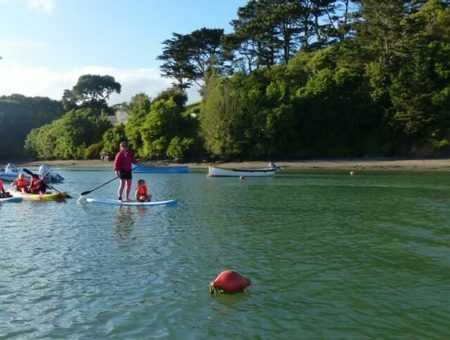 Run by the Field Studies Council, a charity devoted to environmental education and research, the Slapton Ley Field Centre offers a variety of outdoor courses, both directly to enthusiasts and through other organisations. The Fields Studies Council works with primary and secondary schools, colleges and universities to provide opportunities for fieldwork and adventure to children and adults. It also runs the Start Bay Centre, just outside Slapton village. We offer a range of ways to get involved from free family events to family holidays as well as visiting the Beach Trailer for activities and information. Bat watching, pond dipping, Seashore Adventures are just some of very popular activities that we offer. Torcross beach is the name given to the southern edge of Slapton Sands. There is a council-run car park for which full parking permits are valid, and public toilets too, both of which are managed by South Hams District Council. The car park is also home to the Exercise Tiger Memorial. This is a Sherman tank which was recovered from the sea and placed there to honour the 639 American soldiers and sailors who died in Start Bay on April 28, 1944. You can find out more about this tragedy here. At Torcross beach you’ll find some popular eateries with outside tables where you can make the most of the scenery and sunshine. These include the Sea Breeze café and the recently opened Boathouse Restaurant and Takeaway. One of the most popular pubs in South Devon, the award-winning Start Bay Inn is an atmospheric pub with a large, reasonably priced menu and an emphasis on local seafood. Run since 1977 by the same family, it has a cosy traditional feel, complete with a thatched roof, low ceilings and exposed wooden beams. You can see the full Start Bay inn menu here. Stokenham is a leafy, picturesque village with thatched roofed buildings, traditional pubs and some lovely countryside views. Pop into the Tradesman’s Arms or the Church House Inn for some high quality ‘pub grub’ or a cosy drink. Between Stokenham and Torcross on the A379, you’ll also find the Canteen at Stokeley Farm Shop, excellent for breakfasts, lunches and afternoon teas. Beesands is a picturesque fishing village with a mile-long fine shingle beach, children’s play area, nature reserve, popular beachside café and excellent pub/restaurant. Parking is free at Beesands and it’s also at a great location for walkers, being just 1.5 miles from Hallsands along the Coast Path and a short stroll to Slapton Sands. As Beesands is usually quieter than Slapton Sands, Widdicombe Ley is typically an even more peaceful spot for wildlife watching and contemplation than Slapton ley. There’s a wheelchair-accessible hide, providing a good view of the freshwater lake and surrounding vegetation. The Cricket Inn is an award-winning pub and restaurant which serves locally sourced seafood, typically caught within the bay itself. It has held an AA Red Rosette since 2008, which is testament to their ongoing commitment to providing high-quality food. The Cricket Inn also has a remarkable claim to fame as the place where, as teenagers, Keith Richards and Mick Jagger first performed in public. Take a look at the Cricket Inn’s menu here. Like Venus Café at Blackpool Sands, Britannia @ The Beach is far more than a typical beachside kiosk. Also known as The Shack, Britannia @ The Beach is fishmonger, village shop, takeaway and café/restaurant. Its opening hours change with the seasons, so during the summer you can make the most of the warm evenings with an al fresco dinner (under cover), enjoying views of the beach and out to sea. 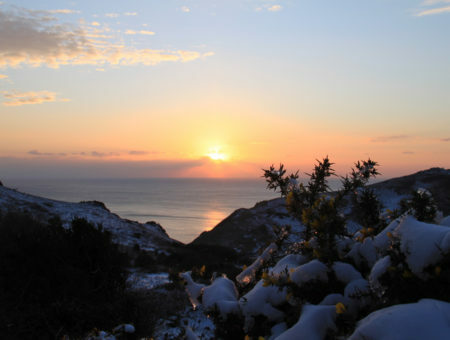 You can find out more about Beesands beach here. We’ve also picked out three of our favourite fishing villages in Devon in this article. Hallsands is a beautiful coastal village towards the southern end of the bay. Along the Coast Path, it’s located around 1.5 miles from Start Point and its iconic lighthouse to the south, and a similar distance to Beesands beach to the north. As such, it’s very popular as a scenic waypoint amongst hikers and dog walkers. Hallsands has a tragic, yet inspiring history dating back to 1917, when the village of South Hallsands was lost to the sea after a storm. Two sisters, Patience and Ella Trout, famously refused to let this misfortune get the better of them. They used their modest compensation payments to purchase land and secured a loan to build a hotel which continued to operate for three decades. Prospect House is now a complex of luxury apartments, two of which are available as holiday homes with Coast & Country Cottages. Few visitors to Start Bay can fail to be intrigued by the iconic lighthouse that stands at its southern tip. Start Point is a gloriously rugged section of coastline tipped with this wonderful building. Here the scenery is a far cry from its gentle beaches but no less beautiful for its craggy edges. It’s a challenging hike down to the rocks from the Start Point car park [post code: TQ7 2ET] but well worth it for the memorable views. Continuing westward around Start Point will also take you to Mattiscombe Beach, a fantastic spot for paddling, picnics and even shore angling if you have the stamina to carry your equipment up and down the hill! See this article for information about similar secluded Devon beaches. As well as appreciating Start Point Lighthouse from the Coast Path, you can also go inside for a guided tour. These take place on the hour on the days it’s open (see below). Admission is charged at £4 for adults, £2.50 for children (5-16 years old) and £12 for a family ticket. Note that there is no parking at the lighthouse itself. So you’ll need to use the Start Point car park, for which seasonal charges apply. The Start Point Lighthouse’s opening times change seasonally, and be aware that it does not open every day even during the summer. Therefore, it’s essential to check before you visit, and the best way to do this is to look on the official website. This is just a flavour of what Start Point has to offer. Why not get to know the stunning countryside fantastic pubs and restaurants, and of course the beautiful beaches next time you’re in in South Devon? Explore our extensive range of luxury holiday cottages in South Devon now.